Were the Northern Lights visible Last night check here! The Aurora detector is special night time page I setup for using my MtAdams DSLR camera in Trout Lake Washington pointed north and taking long exposure photographs at night. The image above is a current shot from that camera. Best viewing times are between 11pm and 2am. If the moon is out lighting up the landscape it might drown out the aurora. Over time i'll include all the relevant links to the prediction websites and eventually would like to capture the Ovation Prime Model Images and be able to compare the images I capture here side by side with them to see the correlation. Basically I wanted to better know if the KP levels I was seeing a the NOAA space weather website were actually producing color in the northern sky on any given evening here around the Washington Oregon border. Then I thought, I wish someone would just setup a camera up where it's dark and upload them to the internet every 5 minutes. SO I DID! So one of the problems with this setup is that in order to take good enough long exposure images to detect the aurora's you have to use a DSLR camera. The upside is that they'll take nice long exposures with minimal noise. The downside is they have mechanical shutters that fail on average every 40,000 releases. I am using a Canon 40d and I estimate that even at the slow pace of once every 3 minutes I will blow through a shutters life expectancy every 83 days. Each time it dies it will cost me roughly $225 to replace. So if you find this camera useful and have a couple bucks burning a hole in your pocket. Otherwise just enjoy the photos! This kind of thing is a passion of mine so either way I'll figure out a way to keep the images coming enjoy! This image was taken June 8th at 1:44 am. It is 30 second exposure. The KP levels were around 6. 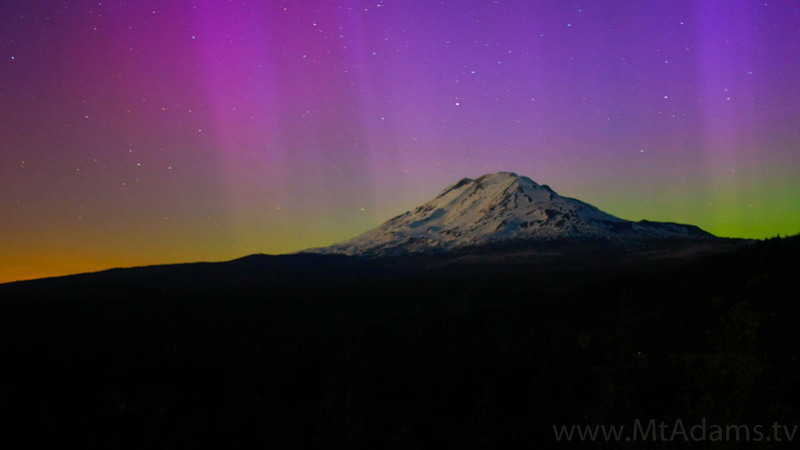 Can you see the Northern Lights tonight in the Northwest? Well the answer isn't quite as simple as the question but what I have setup is a camera located in Trout Lake Washington. Far enough away from most of the light pollution and setup to take long exposure photo (20-40 seconds long usually) necessary to see most of occurrences of the Aurora Borealis phenomenon in lower 48 states. If the image at the top of the page is showing green, yellow or purple bands then YES. If you setup a camera to take at least a 20 second exposure and you're away from the city lights you should be able to see the northern lights. You could also try night vision goggles, I hear they work as well although I've not tried it myself. Values of 5 or more are needed to see anything in the Northwest. Can it be seen with the naked eye? Not usually. Down in the lower 48 states especially near the Oregon border where these images are taken, photographers are able to capture the Northern lights by setting their cameras to open their shutters for longer than 20 seconds to let enough light in to be able to see them. Nigh vision goggles can be use as well to see them but you do need to be away from the city lights away from other light pollution.